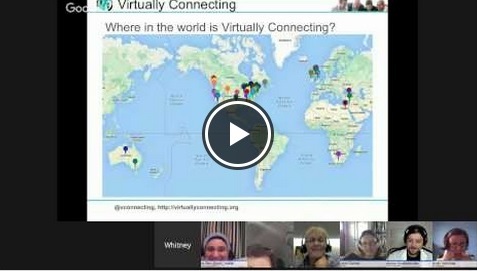 We will be Virtually Connecting (and presenting! About Virtually Connecting! It’s kinda meta) at the Digital Learning Research Network conference (#dlrn15) at Stanford, CA October 16th and 17th. We have one of our largest connecting groups ever with buddies onsite and virtual looking to connect with you! All are welcome and it is free to participate! We are the official virtual arm of the conference check out our page and video trailer on the dLRN website! Be a part of the conversation at #dlrn15! There are several opportunities for Virtually Connecting (see below) as well as Twitter (hashtag #dlrn15) and or Slack to join). If you are already familiar with Virtually Connecting and you are looking for the signup sheet for #dLRN15 it can be found here. If you are new to Virtually Connecting read below and realize that you are signing up for conversations during conference breaks, not to watch/join conference sessions. 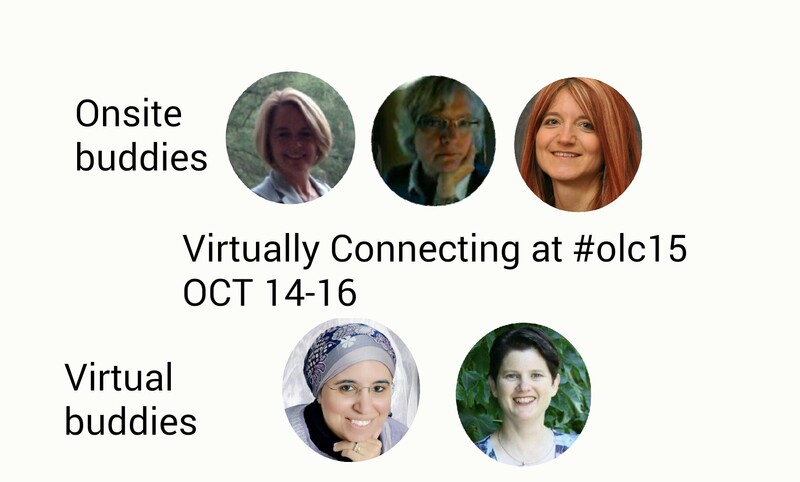 Rebecca Hogue (@rjhogue), Whitney Kilgore (@whitneykilgore), Andrea Rehn (@profrehn), Autumm Caines (@autumm), Patrice Torcivia Prusko (@profpatrice), Ashley G Shaw (@ashleygshaw), Mandy Honeyman (@edtechsinfo), Leigh Graves Wolf (@gravesle). Maha Bali (@bali_maha), Apostolos Koutropoulos (“AK” @koutropoulos), Helen DeWaard (@hj_dewaard, Dina Moati (@dinamoati), Jennifer Englund (@jmenglund03), Greg McVerry (@jgmac1106), Yin Wah Kreher (@yinbk). Mike Caulfield (@holden), Matt Crosslin (@grandeped), Maha Al Freih (@Maha9313), Bonnie Stewart (@bonstewart), Lee Bessette (@readywriting), Alyson Indrunas (@AlysonIndrunas), Jonathan Rees (@jhrees), Catherine Cronin (@catherinecronin), Laura Gogia (@Googleguacamole), Jim Groom (@jimgroom), Adam Croom (@acroom)…and more! Yes you: interested person who can’t get to the conference because funds are low, or it is too far away, or family obligations won’t allow for it… whatever the reason, if you can’t get there we’ve got your back. The conversation at the conference is too important and we want to bring your voice into the mix. It is free to participate with @VConnecting at #dLRN15 – up to 8 virtual participants per hangout – sign up here! You don’t need to prepare, just bring your voice and ideas. As usual – all times listed are in the local conference time PDT. Convert to your timezone here. Thursday Oct.15th 3:30pm pre-conference – Rebecca and Autumm will connect with Laura Gogia for a social pre-conf chat (unfortunately Peggy Semingson can’t make it to the conference). Friday Oct. 16th 12:30pm We will be presenting over lunch and Maha Bali, Rebecca Hogue, Whitney Kilgore, Andrea Rehn, Autumm Caines, Patrice Torciva Prusko will be connecting with several of the conference panels to do 3 simultaneous hangouts with Bonnie Stewart, Mike Caulfield, and Lee Bessette joined by onsite participants such as Matt Crosslin, Maha Al-Freih and Peggy Semingson. We will also be embracing our ethos of spontaneity and may decide to do some last minute sessions. We even have busy conference planners like Dave Cormier (@davecormier), Kate Bowles (@katemfd) and keynotes like Adeline Koh (@adelinekoh) confirmed as a possible drop-in to one of our scheduled sessions or for one of these spontaneous sessions. 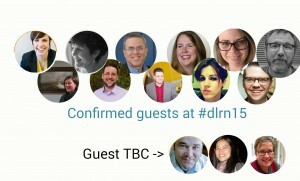 Last minute sessions will be announced on Twitter with the conference hashtag #dlrn15. 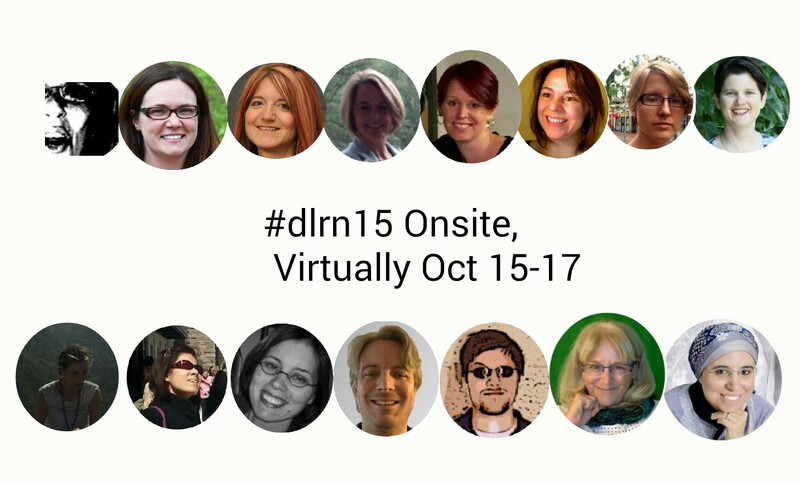 Whether you want to join onsite or virtually – fill out the signup sheet for #dLRN15.